Valerio Valeri (1944–1998) was an Italian anthropologist with an expertise in the societies and cultures of Polynesia and Southeast Asia. A student of both Claude Lévi-Strauss and Louis Dumont, Valeri would go on to become Professor of anthropology at the University of Chicago. He is the author of Kingship and sacrifice: Ritual and society in Ancient Hawaii (University of Chicago Press, 1985), The forest of taboos: Morality, hunting and identity among the Huaulu of the Moluccas (University of Wisconsin Press, 2000), and two posthumous volumes: Uno spazio fra se e se: L’Antropologia come ricerca del soggetto (A space between oneself and oneself: Anthropology as a search for the subject, Donzelli, 1999, edited by Janet Hoskins and Martha Feldman) and Fragments from forests and libraries (Carolina Academic Press, 2001, edited by Janet Hoskins). 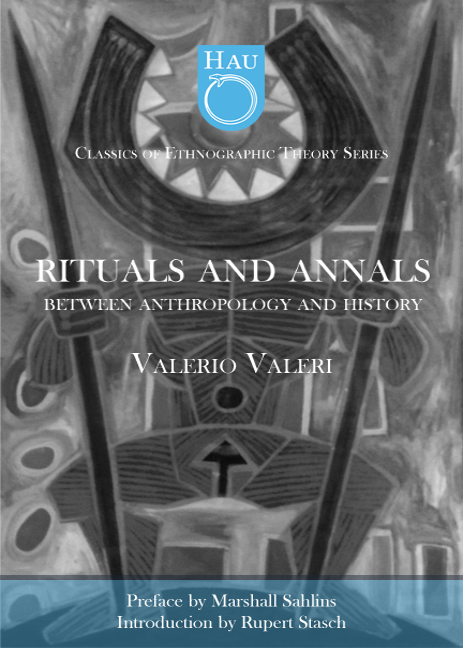 Any superlative diminishes Valerio Valeri and his scholarship, which is characterized by rich, subtle, and complex ethnographic and historical information, underscored by formidable theoretical vigor based on extensive fieldwork. His work is comparative, including ethnographic and historical material from ancient Hawaii, Huaulu of Seram, Yap, eastern Indonesia, and Malaysia, but also includes European cultural and political history, philosophy, and classics—all enabled by his scholarly training in Italy and France, as well as having mastered at least eight languages, including ancient Greek and Latin. Hau‘s publication of this collection is an invaluable contribution which transcends the great divide between anthropology and history and reminds us of what an exemplary anthropology should look like. —Emiko Ohnuki-Tierney, Vilas F. Professor of Anthropology, University of Wisconsin–Madison, author of Kamikaze, cherry blossoms, and nationalisms: The militarization of aesthetics in Japanese history (University of Chicago Press, 2002) and The monkey as mirror: Symbolic transformations in Japanese history and ritual (Princeton University Press, 1989). This new volume, with selections from Valerio Valeri’s writings, is especially timely today. It will be welcomed, not least, by all those interested in the anthropology of sovereignty and power. The selected essays on kingship, ideology, and power shows Valeri at his very best: always aiming to address the truly important big issues, while unfailingly and astutely delving into the historical particulars of each case before him. (“But where is the ethnography?” as he would say in class!) Following the posthumous publication of The forest of taboos (University of Wisconsin Press, 2000)—a book that is, without question, the most profound and serious work available anywhere on the classic anthropological problems of taboo and pollution—as well as that other marvelous collection, Fragments from forests and libraries (Carolina Academic Press, 2001), this new posthumous collection from Hau is to be commended: It makes it easier for us all to keep coming back to Valerio Valeri—to reading ethnography with the big questions in mind. —Magnus Fiskesjö, Associate Professor of Anthropology, Cornell University, author of The Thanksgiving turkey pardon, the death of Teddy’s bear, and the sovereign exception at Guantanamo (Prickly Paradigm Press, 2003). Here is another contribution from a great and unique master–a work of solid, rigorous, and vast knowledge, but also a work of continuous learning (in libraries, forests, and life). Valeri had an ability for amazement and wonder that came from a practice of ethnography which, rather than being a nominalist search for historical details, looked to life itself as a source of percepts as well as a producer of concepts. —Marcos P. D. Lanna, Associate Professor of Anthropology, Universidade Federal de São Carlos, author of A Dívida divina, troca e patronagem no nordeste brasileiro (Ed. Unicamp, 1995). Throughout his oeuvre, Valeri called for both an anthropological understanding of time and a history of social structures. At the end of his life, he set himself an ambitious task: to understand how ritual transforms the experience of time (and the past itself) in a certain idea of transcendence, and thus how social memory can be expressed through ritual action. In this book, one can follow, step by step, Valeri’s unparalleled program. Among other felicities, this book offers an original appreciation of religious ritual as a utopian order and a new way of articulating social anthropology with history. —Carlo Severi, Chair in “Anthropology of Memory” at the École des Hautes Études en Sciences Sociales (Paris), author of Naven or the other self: A relational approach to ritual action (with Michael Houseman, Brill, 1998) and Le principe de la chimère. Une anthropology de la mémoire (Rue d’Ulm/Musée du Quai Branly, 2007, English translation forthcoming).